Donald Trump’s America-First policy on trade is boosting profits for Canadian companies more than US firms, according to a story in Bloomberg Politics. “If it were a weak market… they’d have to eat the tariffs”. 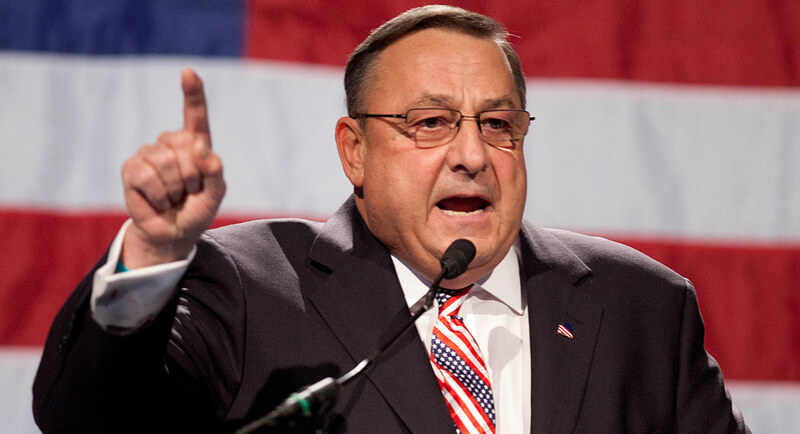 But “housing production is holding steady” says the NAHB, and Maine’s Governor—a critic of softwood duties—blames the high prices on a coalition of businesses that are in a position to potentially “price-gouge distressed Americans“. A new biomaterial made mostly from wood pulp and chitosan (sea shells) could replace plastic laminates, greatly reducing pollution. In other wood news, the Arkansas’s first demonstration of mass timber construction breaks ground via a large library storage facility, while New Zealand chases mass timber manufacturing to solve its housing shortage. An Edmonton fragrance-maker sees the forest for the breeze. Josh Smith came to Edmonton to take a forestry program at NAIT, but switched his career path when he found a way to harness the scents of the woods in unisex fragrances. Libertine Fragrance specializes in smells like mossy forest floors and freshly cut hay. “Some are kind of woody, I’ve got more cedar and fir notes and those sort of things – some that are more herbal and grassy, and on the other side more fruit or floral inspirations,” Smith said. …Smith’s business started as a school project, when he took design at the University of Alberta and incorporated what he previously learned at NAIT. Donald Trump’s policy on trade since becoming U.S. president has been all about putting “America First.” But in one corner of the commodity world, his actions are having the opposite effect. In a move intended to protect the domestic lumber industry, the U.S. this year slapped duties of as much as 31 percent on imports of timber from Canada… Prices surged, increasing costs for American buyers — and boosting profit for Canadian producers. 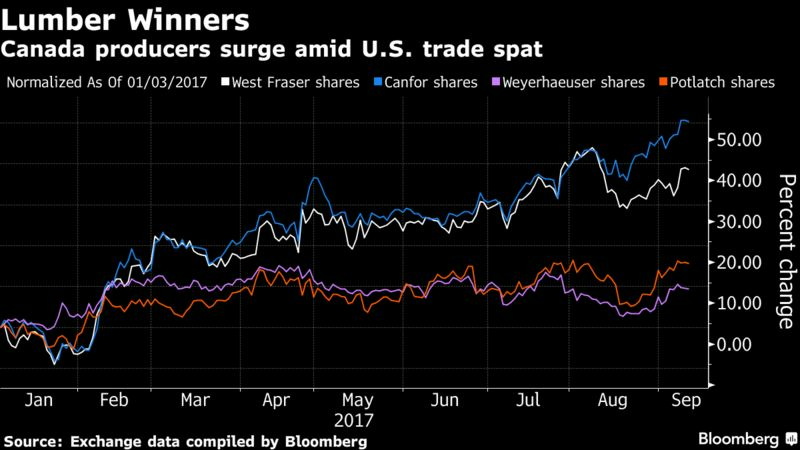 Shares of Canadian softwood lumber producers Canfor Corp. and West Fraser Timber Co. are outperforming their American peers with gains of more than 40 percent this year, placing them among the top performers on the BI Global Paper and Wood Products Index. By contrast, shares of U.S. rival Weyerhaeuser Co. are up about 10 percent. 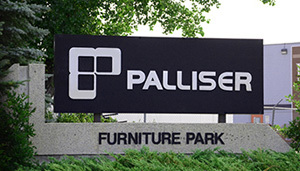 By Palliser Furniture Holdings Ltd.
HALIFAX — Residents of a Nova Scotia community who are learning second-hand about excessive air pollution from a nearby pulp mill say the province is being lax and secretive about emission levels. Matt Gunning, a volunteer with the community group Clean the Mill, says people living across the harbour from the Northern Pulp Nova Scotia Inc. mill in Pictou should be able to monitor pollution levels on the provincial Environment Department’s website — especially when they are over the limit. …Company spokeswoman Kathy Cloutier said the company is disappointed with the results for its power boiler, and is trying to determine what happened. Nationwide housing starts fell 0.8 percent in August to a seasonally adjusted annual rate of 1.18 million units, according to newly released data from the U.S. Department of Housing and Urban Development and the Commerce Department. Single-family production rose 1.6 percent in August to a seasonally adjusted annual rate of 851,000 after a downwardly revised July reading. Year-to-date, single-family starts are 8.9 percent above their level over the same period last year. Multifamily starts dropped 6.5 percent to 329,000 units after an upward July revision. Domestic lumber demand is flat. The demand from Christchurch is dropping significantly, but there is an increase in the Otago Lakes area driven by building in Queenstown and Wanaka. There has been a cooling in the development of medium to high rise apartments as banks require a high percentage of pre-sales before lending, but buyers don’t want to place deposits if the build isn’t confirmed. The rest of New Zealand is flat with some mills reporting their sales into the areas of Hamilton and Tauranga down on last year. These areas are still growing but the rate of growth has slowed. MONTREAL — Canada’s special envoy to the European Union Stephane Dion joined 19 other international dignitaries in signing the Bordeaux Alliance recently, committing nations to adopting strategies to boost the use of wood in midrise and tall wood buildings. 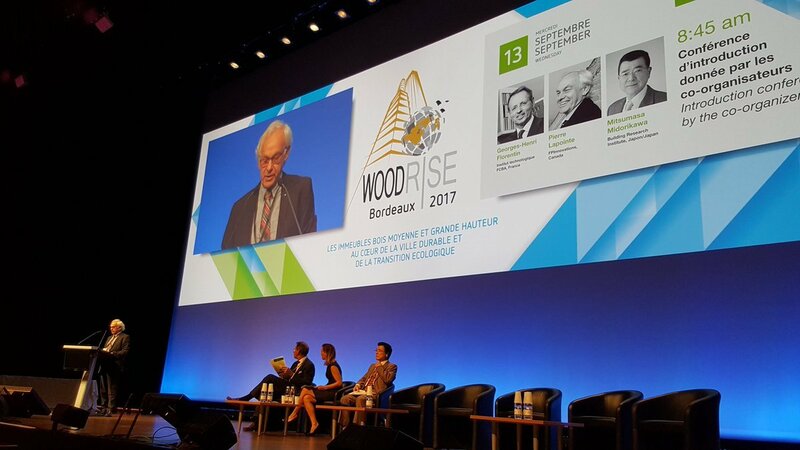 The initiative was one of several taken to promote the use of wood in construction at Woodrise 2017, a conference held in Bordeaux, France beginning Sept. 14. A media statement called it the first world congress dedicated to midrise and tall wood buildings. The representatives also made a formal call for stakeholders to take one step closer toward carbon neutrality by strengthening the share of wood used in building construction. Canada’s FPInnovations… was one of six organizations to sign a research memorandum. An inexpensive biomaterial that can be used to sustainably replace plastic barrier coatings in packaging and many other applications has been developed by Penn State researchers, who predict its adoption would greatly reduce pollution. Completely compostable, the material—a polysaccharide polyelectrolyte complex—is comprised of nearly equal parts of treated cellulose pulp from wood or cotton, and chitosan, which is derived from chitin—the primary ingredient in the exoskeletons of arthropods and crustaceans. The main source of chitin is the mountains of leftover shells from lobsters, crabs and shrimp consumed by humans. These environmentally friendly barrier coatings have numerous applications ranging from water-resistant paper, to coatings for ceiling tiles and wallboard, to food coatings to seal in freshness. Studies have proved that houses need far more than solar panels and recycling systems in order to be considered not only green but also healthy. 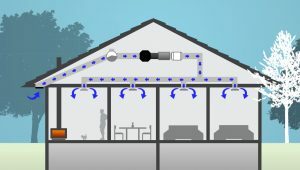 One such research project has shown that homes that do not have proper ventilation may face the dangers of Volatile Organic Compounds buildups, which are harmful to both the environment, as well as to the inhabitants of the buildings. …The results have shown that there are several factors that impact VOC emissions. The most important of them is the age of the materials. Research has shown that new or renovated buildings have the largest concentrations of VOCs. 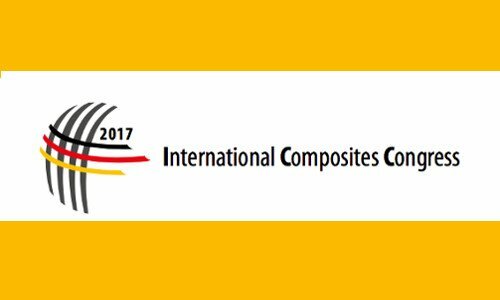 PORTO/LUDWIGSHAFEN, Germany — At the International Composites Congress in Stuttgart, BASF and Sonae Arauco were jointly honored with the AVK (German Federation of Reinforced Plastics) Innovation Award 2017 for a new development in 3-D moldable wood fiber components. The two companies ranked first in the category “Innovative products/components or applications” for providing the furniture industry with a storage stable composite that can be processed by hot molding. 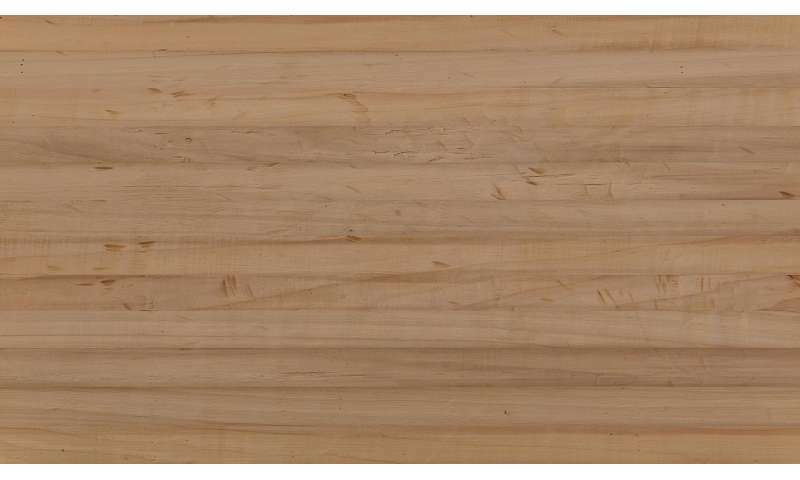 In contrast to standard thermoset boards, the new wood-based composite is able to be post-molded and its surface can be structured in short cycles on standard furniture molding equipment. British Columbia’s wildfires, still not fully under control, have already scorched the equivalent of the entire year’s timber harvest in the province’s Interior. …”What’s important for people as they come back to their homes and they want life to get back to normal, they want to go back to work and for many, that means coming back to work in our mills,” said Susan Yurkovich, president of the Council of Forest Industries. …”Forestry in British Columbia is in transition and these wildfires have compounded that, especially in the Interior where the mountain pine beetle wood is starting to run out,” said Forests, Lands and Natural Resource Operations Minister Doug Donaldson. The rookie minister has been meeting with the industry to fast-track new cutting permits as well as salvage licences. With about 150 fires still burning at last count, however, it will be months at least before a clear picture of the losses – and alternatives – emerges. 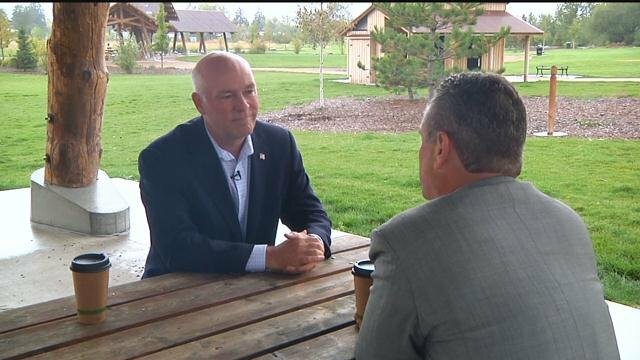 Why is Congressman Gianforte afraid of the Park Creek Fire? Congressman Greg Gianforte has spent a lot of time lately talking about his fear of forest fires. That’s understandable — many people fear and misunderstand this natural process. But we are especially confused about his fear of the Park Creek lightning fire, north of Lincoln, Montana. Gianforte has repeatedly claimed that an illegal logging project — the Stonewall project on the Helena-Lewis and Clark National Forest — would have stopped the Park Creek fire or substantially reduced its intensity, if a federal judge had not enforced federal laws and halted it. CREEDE — Divide District Ranger Martha Williamson signed the decision notice approving the Blue Park Spruce Beetle Salvage Project on Wednesday, September 12. 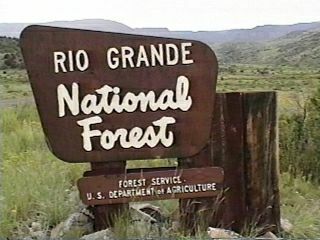 This timber management project is located on the Rio Grande National Forest about 10 miles southeast of Creede in the Blue and Long Park area. “The Blue Park Spruce Beetle Salvage Project will recover the value of dead and dying trees while supporting local and regional economies with a stable supply of forest products,” said Williamson. Williamson approved the proposed action analyzed in the environmental assessment. The proposed action allows for harvesting dead and dying trees on approximately 3,200 acres of forest lands, yielding about 13 million board feet of sawtimber, or enough timber to provide all the wood products needed to construct more than 430 homes. David Winter sat down with the Congressman as he approaches his first 100 days in office. We covered a variety of topics, from his biggest challenges so far in Washington, to his new Forest Jobs Tour. …”We harvest about 100 million board feet of timber in Montana on federal land now,” says Gianforte. “If we could get back to 300 million board feet, we could get back to these mills at full capacity. So, we have the capacity, the demand exists for the timber, and from a conservation perspective, when we sequester carbon in a fully mature tree and turn it into a two-by-four and put it in a house, that’s good for the environment too.” And good for jobs says Gianforte. Idaho has been seeing success with using the “Good Neighbor Authority” it was granted under the 2014 federal Farm Bill to partner with the U.S. Forest Service and increase active management and timber harvests on national forests in the state – and it’s poised to ramp the program up. “Right now we have two foresters doing GNA projects across the state, so we’re looking to significantly expand this program,” state Department of Lands Director Tom Schultz told the state Land Board today. In the department’s budget request for next year, it’s asking for eight new positions, all from dedicated funds. That would allow the department to create a new GNA Bureau within its Forestry & Fire Division, and up the staffing for GNA programs from the current 4.3 positions to 12.3. Two Forest Service officials touted the success of the program to the Land Board on Tuesday. The Milli fire is one of more than a dozen large wildfires that took hold in the state this summer, in what has been a bad season for forest fires across the entire west of the country. But unlike many of this season’s wildfires that grew out of control – the Eagle Creek fire in the Gorge received the most attention because of its proximity to Portland – the Milli fire is cited as a success story because it was easily contained. Most of the fire is now under control. 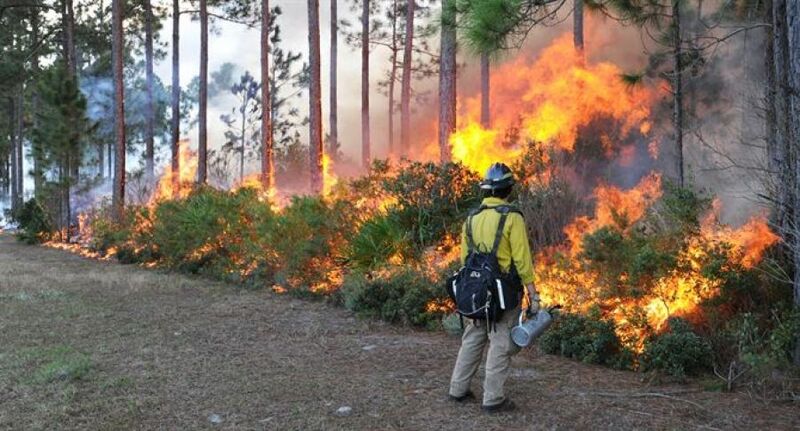 …The Milli fire is an example of the positive outcome of how forest management collaboratives can help reduce wildfire risk while maintaining a healthy forest. It has been more than two weeks since Secretary of the Interior Ryan Zinke released an underwhelming report about the fate of our national monuments and America’s public lands. To date, the recommendations remain unavailable to the public, although a leaked report over the weekend recommends major changes to benefit extractive industries, including logging. Zinke also released a controversial statement on fire management in response to the mega-fires sweeping across the West, stressing a “more aggressive approach” for fire prevention. That translates to clear-cutting and essentially a pass for logging companies to move in. It throws a bone to the timber industry while failing to provide funding for well-thought-out and locally vetted management plans. In California, the 2012 Giant Sequoia Management Plan, developed with community input and years of effort, would be lost to private industry management, an approach that has a bad track record on fire. 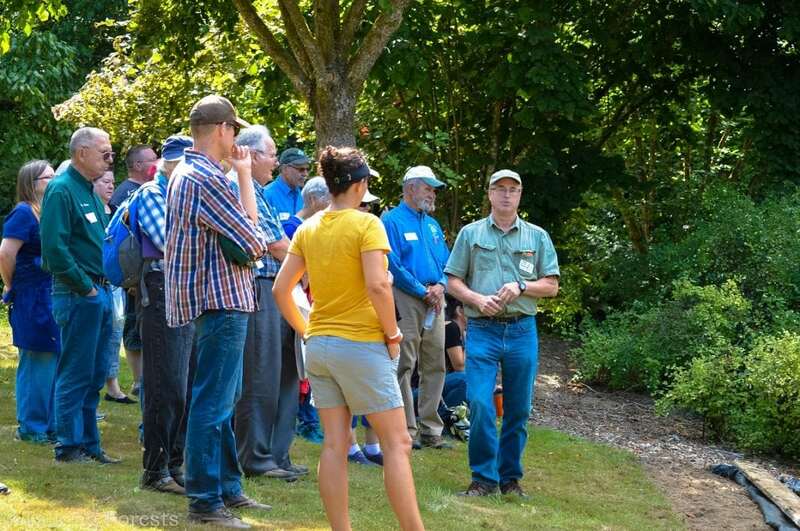 On a bright and sunny summer day,forest landowners came together for field sessions and educational opportunities put on by Washington State University Extension Forestry and the Washington Department of Natural Resources Small Forest Landowner Office. The Field Day event, held on August 19, was hosted by John Henrikson of Wild Thyme Farm and provided resources to landowners from across Washington State. The field day was inclusive with every topic ranging from agroforestry to help with your forested property taxes. …The stations were nestled in the woods and had experts from each field educating both new and experienced landowners. Lisa Pohlmann, executive director of the Natural Resources Council of Maine, served notice to the Trump administration that allowing “commercial logging” in the Katahdin Woods and Waters National Monument would “almost certainly trigger a lawsuit.” Pohlmann’s warning is in response to a leaked report from Secretary of the Interior Ryan Zinke to President Donald Trump advising that the executive order that created Katahdin Woods and Waters National Monument be amended to promote a “healthy forest through active timber management.” …”Without more details, we cannot yet judge whether these recommendations are acceptable and… problematic for the intended purpose of this monument, or illegal and likely to trigger action in the courts,” Pohlmann said. Local timber workers are waiting at the ready to deliver Prime Minister Malcolm Turnbull’s vision for a stronger timber industry, according to Deniliquin’s Gulpa Sawmill owner Ben Danckert. Mr Danckert, who is chair of The Nationals’ Red Gum branch, said all the industry needs is access to the forests which had supplied commercial timber for generations. …Mr Turnbull said he was ‘‘committed to developing this (timber) industry as a growth engine for regional Australia’’ at the Australian Forest Products Association dinner last Tuesday in Canberra. The Elephant Hill fire has not seen any grown in the last while, and as of today the fire is 85 per cent contained, says Fire Information Officer Erin Catheral. “Crews are continuing to make good progress on the fire, this with the cooler weather conditions that we have received has definitely helped with suppression efforts,” she says. “Just having a guard around the fire isn’t sufficient for containment, we have to remove fuel from the guard around the fire perimeter,” says Catheral. As heavy rain turned to snow in Oregon’s high elevations Tuesday, fire crews prepared to wind down operations on multiple wildfires across the state. Four inches of snow fell on fire camps on Santiam Pass, bringing welcome help to firefighting efforts but also creating cold and wet conditions for teams looking to bring an end to Oregon’s tumultuous fire season. Most evacuations caused by the wildfires have been eliminated statewide, while closures on trails and campgrounds mostly remain. Landslides and flash floods have become a more pressing threat, especially in places with steep slopes burned this summer such as I-84 in the Columbia River Gorge and U.S. Highway 20 on Santiam Pass. After lightning ignited a small fire on Rowe Mesa southeast of Santa Fe, Santa Fe National Forest managers decided to expand the blaze into a much larger “controlled burn” rather than extinguish it immediately. The Palmer Fire began Sept. 12 in a mostly grassy meadow speckled with ponderosa pine and piñon-juniper, between the Pecos and Las Vegas ranger districts. The fire covered just 35 acres, but the Forest Service said it intends to vastly increase the burn to 11,500 acres. 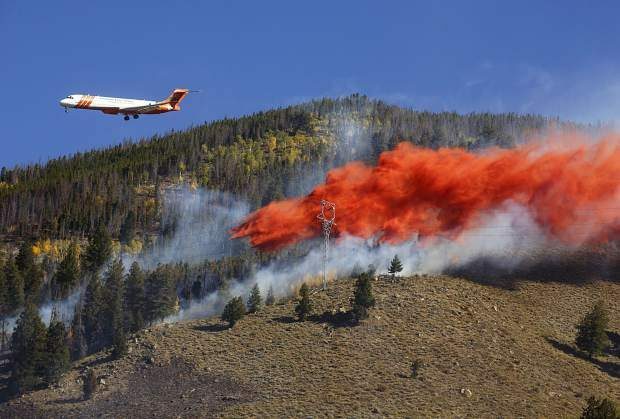 The winds came with fury on Tuesday, but they were too late to rouse the Tenderfoot 2 Fire near Dillon. By the afternoon, its once-fearsome plume of smoke had reduced to pale wisps, and in the evening fire officials declared it 50 percent contained. Firefighters and aircraft hammered away at the fire early in the morning when the day was still calm, and their work paid off, keeping the blaze from growing even when the wind howled as fast as 50 miles per hour. 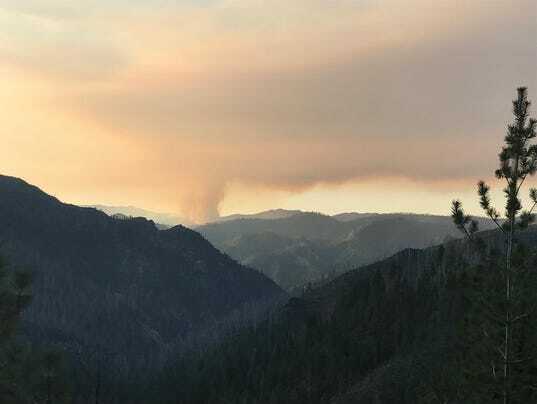 “We had a solid box around the fire before the winds picked up,” U.S. Forest Service incident commander Eric White said Tuesday evening.